Thailand, officially the Kingdom of Thailand, formerly known as Siam, is a country at the centre of the Indochinese peninsula in Southeast Asia. With a total area of approximately 513,000 km2, Thailand is the world's 51st-largest country. It is the 20th-most-populous country in the world, with around 66 million people. The capital and largest city is Bangkok. Thailand is a constitutional monarchy and has switched between parliamentary democracy and military junta for decades, the latest coup being in May 2014 by the National Council for Peace and Order. Siam issued its first stamp, the Solot Series, on 4 August 1883. Click on image to enlarge it. Click on year number to see all Paleontology and Paleoanthropology related stamps issued in the year. Issued in sheets and booklets of 10. Issued in individual sheets of 20 stamp and common mini sheet. At least one stamp of the set issued in booklet of 5. 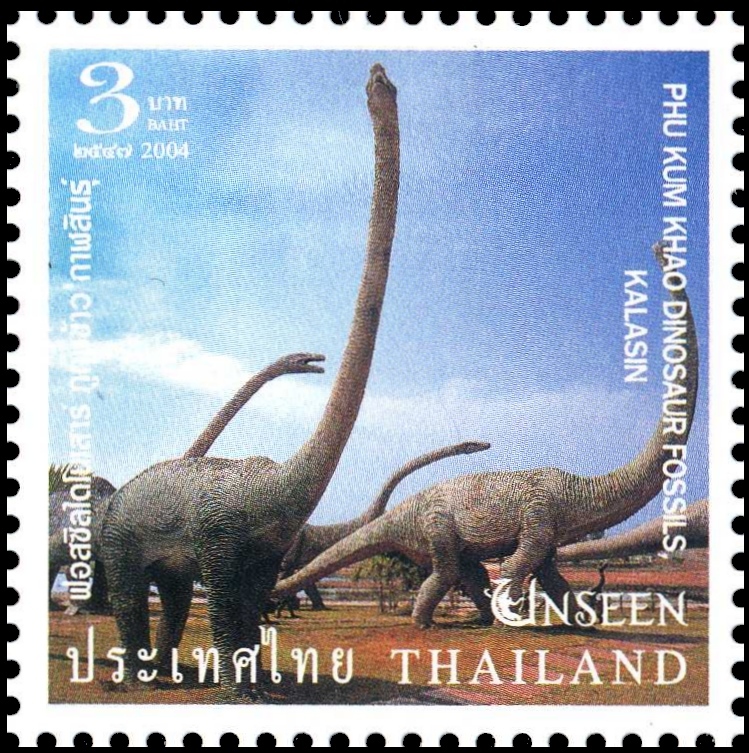 Fourth stamp on the second row shows some reconstruction dinosaurs at Phu Kum Khao Dinosaur Museum at Kalasin very likely Phuwiangosaurus. Phuwiangosaurus is a genus of dinosaur from the Early Cretaceous. It was a titanosaur which lived in Thailand. The type species, it was named to honour Princess Maha Chakri Sirindhorn of Thailand, who was interested in the geology and palaeontology of Thailand. Some sculptures of dinosaurs stay in park at the museum. One of stamps from 1997 surcharged in 2008. Old value of 6 baht replaced by new value of 15 baht. [P1] The three–storey building of Rangsit Science Centre for Education comprises of 15 galleries, most of which are interactive and hands-on related to various science and technology themes, one of them is“Prehistoric World” which displays in 6 zones such as back to the past that we can learn about fossil and classes of rock, the formation of planet, the evolution of dinosaur, mammal, reptile, and the discovery of dinosaur in Thailand. [P2] The stamp set, released by Thailand Post in recognition of UNESCO’s 70th Anniversary this year, comprises two sheets of 20 stamps, with attached unique label, each featuring all 37 of South-East Asia’s World Heritage sites. The stamp sheets that form the set are attractively designed, with photos carefully selected to highlight the diverse, and culturally rich World Heritage treasures of the region, making it an attractive option as a commemorative showpiece. A QR code on each stamp sheet also links to the World Heritage website for further information about the sites. The face value of each stamp is 3 baht. Sangiran man skull can be seen on one of the labels. Sangiran Early Man Site is situated about 15 kilometers in the north of Solo town in Central Java, Indonesia, covering an area of 5,600 hectares. It became famous after the discovery of Homo erectus remains and associated stone artifacts (well-known as Sangiran flake industry) in the 1930s. There is a very significant geological sequence from the upper Pliocene until the end of Middle Pleistocene by depicting the human, faunal, and cultural evolutions within the last 2.4 million years. The property also yields important archaeological occupation floors dating back to the Lower Pleistocene around 1.2 million years ago. Sangiran is one of the key sites for the understanding of human evolution.